A wonderfully flavorful, super rich tasting and healthy, side dish. I made it the other night and had to stop myself from eating all of it. It's that good!! You'll love how easy spaghetti squash is to cook. A wonderfully flavorful, super rich tasting and healthy, side dish. I made it the other night and had to stop myself from eating all of it. It's that good!! You'll love how easy spaghetti squash is to cook. I like to bake the squash whole or cook in a crock-pot. I've included instructions for both ways. Each cup has 93 calories, 5 grams of fat and 2 Weight Watchers SmartPoints. Serve alongside chicken, beef, pork or fish. Or, make it a vegetarian meal and top with Parmesan cheese. 1. To Cook in Oven: Preheat oven to 375 degrees. Pierce squash a few times with sharp knife (to let steam escape). Place squash on a baking pan lined with foil. Bake spaghetti squash for about 50 minutes, or until a sharp knife pierces easily through skin. Let squash cool for 10 minutes. To Cook in Crock-pot: Place whole squash in crockpot. Add a little water and cook until tender, about 2-3 hours on HIGH or 5-6 hours on LOW, depending on its size. 2. Once cooked, cut squash in half, lengthwise. Use a fork to remove and discard seeds. Continue using a fork to scrape squash to get long strands. If the squash seems difficult to scrape, return squash to bake for an additional 10 minutes. Place spaghetti squash strands in a strainer to drain excess moisture. Thoroughly blot dry with paper towels, removing as much moisture as possible. 3. Heat a large, nonstick pan with butter and garlic, over medium-low heat. Heat for about 1 minute. Add spaghetti squash strands. Toss well. Sprinkle in a little salt and pepper. Continue to toss and cook until thoroughly heated.The spaghetti squash should have a slight crunch. Makes 4 servings about 1 cup each. This fabulous squash is still in the supermarkets. Like other hard-shelled winter squash, spaghetti squash is harvested in early fall and available through spring. The squash keeps for months stored in a cool place. 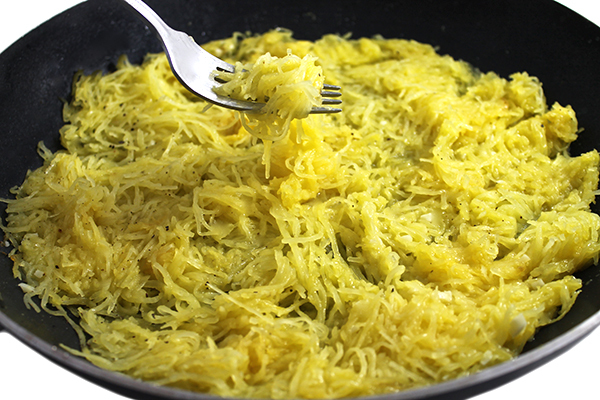 Once cooked, spaghetti squash turns into thin, pasta-shaped strands of squash (hence, the name). Baking time really depends on how big your squash is-try to get the smallest one, especially if you're only feeding 4 people. It's ready if you can pierce the squash with a knife with little resistance.